More precisely, let’s talk about how to keep your calendar. There are many ways to organize it. How you use your calendar is as personal as the clothes you wear. But Timeboosters are different. Timeboosters calendar with intention. The idea is simple. Be strategic about how you fill up your days. Make each of those little blocks on your screen move YOUR ball forward professionally or personally. It’s the best way to make time work for you. As Fried explains it in this Medium post, he likes to keep his calendar mostly open so he can make decisions about what he’s doing that day that day. In the moment. Not weeks and weeks in advance. But the reality is that this kind of calendar won’t work for a lot of people. You might need more structure, and a much more booked schedule. If you’re a consultant who caters to demanding clients or a product manager within a large organization, you likely can’t dictate all of your meeting times. As the founder and CEO of his own company, Fried has more flexibility than most. This calendar probably looks familiar. It’s packed, like most of the people using Timeboost. But take a closer look. Notice the blocks of time called “Morning Routine” (6 to 8 a.m.) and “Make Time” (8 to 11 a.m.). Jenkin doesn’t schedule any meetings during these hours. None. In this post, Jenkin explains that his “Morning Routine” is time that’s set aside for him to think about things outside of work. “Make Time” is devoted to doing the actual work. Not taking meetings. Not answering e-mails. Jenkin spends these hours on conceptual work or detailed production work, like designing. “I need to have at least 3 hours of continuous, uninterrupted time to really get deep on the work and make significant progress or produce something that I can feel good about,” he writes. This practice of setting aside time to go deep into your work is exactly what Cal Newport preaches in his book, “Deep Work: Rules for Focused Success in a Distracted World.” By setting aside the time and space to go deep, we produce better results. But many of us have essentially lost this ability to really focus on doing one task without getting distracted. By social media. By email. By our constant need for new stimuli. That’s where being intentional with your calendar can elevate your productivity and your state of mind as a result. Think of your calendar as a roadmap to your goals, laid out in hourly increments. Every time you put something in your calendar, ask yourself: How is this helping my goals? It doesn’t matter if the goal is professional (I need to get better at managing my team) or personal (I want to spend more time with my kids). It’s okay to spend time on Twitter or Facebook. By calendaring “chill time” or whatever you want to call it, you get the benefit of relaxing, without the risk of losing your day. Your calendar can keep you from getting lost. And make you super productive. Just ask yourself “Is this block of time moving me forward?” before creating or accepting a meeting. And before your calendar is completely blocked for the week, go in there and book time to get the work and personal items that matter most to you done. You’ll do a better job hitting your goals and feeling like the day didn’t just fly by. 1. List the top five high-level goals I need to work on. 2. Decide what percentage of my time should be allocated to each one. 3. 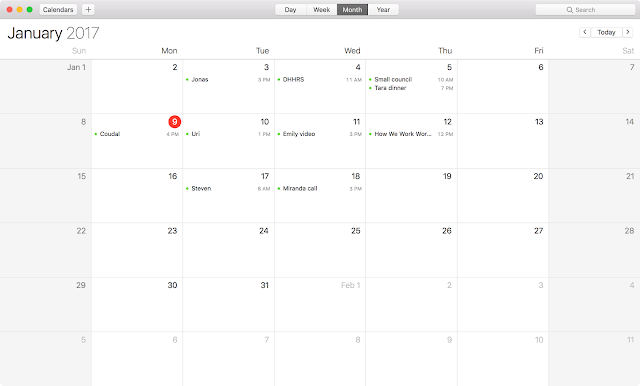 Create recurring calendar blocks that map to those things. “The key is being purposeful about what you focus on and how much time you’re going to devote to each focus area,” he says in this Medium post. So there’s no secret or complicated process to making the most of your calendar. It’s really just knowing your goals and being intentional about blocking off time in your calendar to work on those goals -- ideally with a lot of focus. Start today.